The best part of a North Myrtle beach vacation is, of course, the beach. 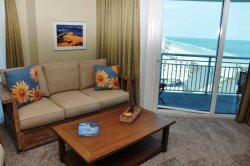 When you stay in one of our oceanfront North Myrtle Beach rentals for your vacation, you’ll enjoy unlimited sweeping views of the southern Atlantic coast and the unparalleled scent of fresh sea breezes. There’s nothing better than waking up to the sound of the waves outside your window and peering over your balcony at the awe-inspiring sunrise over the water. Stay in one of our beautiful oceanfront condos or private homes and enjoy great amenities and locations, all just steps from the soft sand of our beaches.